BUDAPEST, Hungary — A group with alleged historical links to Nazi Germany has told NBC News it was "proud" when President Donald Trump's deputy assistant wore its medal. 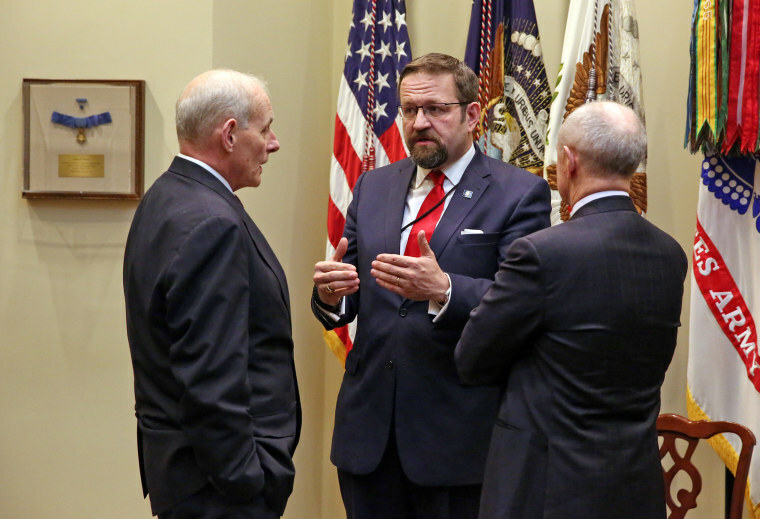 Controversy has swirled around Sebastian Gorka, one of Trump's top counterterrorism advisers, ever since he attended the president's Jan. 20 Inaugural Ball wearing the honorary medal of Hungarian nationalist organization Vitezi Rend. NBC News traveled to Hungary to dig deeper into Gorka's ties with the group, speaking with members of the organization as well as with locals who knew him when he lived there. "When he appeared on U.S. television ... with the medal of the Vitez Order ... it made me really proud," Vitezi Rend spokesman Andras Horvath said in the Hungarian capital of Budapest. Vitezi Rend is also known as the Order of Vitez. Three people, including one of Gorka's former political allies, said he was a well-known member of Vitezi Rend back in Hungary, a charge he strongly denies. Gorka's decision to wear the medal — which he said was awarded to his Hungarian-born father — has provoked outrage among Jewish groups. While in Budapest, NBC News also spoke with Andras Heisler, the Hungarian vice-president of the New York-based World Jewish Congress, who said that wearing the medal "isn't a good message for a democratic society." Vitezi Rend was founded in 1920 by Hungarian ruler Miklos Horthy to award medals to Hungarian veterans of World War I. But the group's history became murky after the country allied with Nazi Germany in 1938. Heisler told NBC News that members of the organization were likely complicit in the murder of some of the hundreds of thousands of Hungarian Jews toward the end of World War II. During the war, the State Department listed Vitezi Rend among a group of "organizations under the direction of the Nazi government of Germany." And Horthy, its founder, once said that "I have always been an anti-Semite throughout my life," according to "The Jews of Hungary," a 1995 book by Hungarian-Jewish historian Raphael Patai. The Soviet-allied communist government outlawed Vitezi Rend when they took control of the country after the war. But since then, several private organizations have emerged claiming to be the true successors of the group and its ideals. Horvath, the spokesman interviewed by NBC News, represents the most prominent modern-day faction. He vehemently denied his organization of 5,000 members is anti-Semitic or extremist, although he conceded that his group has no Jewish members. According to its followers, Vitezi Rend is merely "a politically independent organization with Christian-conservative values that keeps its military traditions," said Vitez John Molar-Gazso, the captain of another modern-day faction of the group. "It has never been radical or a fascist group. Its members have always defended the nation's interests and fought for the Hungarian communities," he said. Similarly, Gorka has denied he has ever been a sworn-in member of Vitezi Rend — whose name translates to "valiant order." In several statements to the media, he has explained that he wore the medal to honor his late father, Paul Gorka, who was awarded it for his fight against communism during Hungary's period of communist rule. He has given a similar reasoning for occasionally using the initial "v." in his name — a mark used by Vitezi Rend members to show the order has been bestowed upon them. He said it was in remembrance of his dad. Last month, three Vitezi Rend officials told American-Jewish newspaper The Forward that Sebastian Gorka was one of their order. The reports about Gorka prompted the Anne Frank Center for Mutual Respect, an American civil-rights group, to call for Sebastian Gorka's resignation, or at least an investigation into his alleged links with the far-right. "How many ducks in the Trump White House must walk, talk and quack Anti-Semitically before our country wakes up and sees the greater problem?" it told NBC News in a statement. "Who among us wears a medal of a Nazi-sympathetic organization to remember loved ones?" When asked about the allegations in NBC News' investigation, Sebastian Gorka dismissed them as "fake news" and pointed to a statement he gave to online Jewish magazine Tablet last month. "I have never been a member of the Vitez Rend. I have never taken an oath of loyalty to the Vitez Rend," he told the publication. "Since childhood, I have occasionally worn my father's medal and used the 'v.' initial to honor his struggle against totalitarianism." He told NBC News he "completely distanced myself" from any white-supremacist or Nazi ideology. He declined to answer specific questions about NBC News' reporting. Horvath, the Vitezi Rend spokesman, said Paul Gorka was a senior Vitezi Rend lieutenant for the western Hungarian city of Sopron and its surroundings. "This is, in the various ranks of the order, an advanced level," he said, his own Vitezi Rend medal on proud display. The 69-year-old was speaking on the banks of the Danube river in Hungary’s storied post-Soviet capital, where some buildings still bear bullet-holes from a failed anti-Soviet revolution in 1956. Paul Gorka "was more than an average Vitezi member ... I had good experiences and conversations with [him]," the spokesman said, his grey hair and trimmed moustache matching his relaxed yet matter-of-fact demeanor. Although Horvath was unable to confirm that Sebastian Gorka was a member himself, he said it was possible. There are many chapters all over the world, he said, any of which could have conducted the inauguration ceremony. He explained that the first sons of Vitezi Rend members can either choose hereditary membership or to apply in their own names. "The membership can be inherited by the children and this membership enters into force when they participate in an inauguration ceremony," said Molár-Gazsó, the captain of the other Vitezi Rend group. Sebastian Gorka, 47, was born in London in 1970 to Hungarian parents and gained American citizenship in 2012. Before finding his seat in the president's inner-circle, he spent years in his parents' former homeland in the 1990s and 2000s. After interviewing Horvath and Heisler in Budapest, NBC News drove 14 miles north to the small, sleepy town of Piliscsaba, where several prominent locals alleged that Sebastian Gorka was a member of Vitezi Rend. The future White House aide ran for mayor here in 2006, but was unable to persuade its population of 7,500 that he was the right man for the job. He came third out of three candidates but only lost by a margin of 39 votes. "Everybody knew that he was member of the Order of Vitez," according to Csaba Gáspár, who came in second that day but later became mayor between 2010 and 2014. This was corroborated by one of Sebastian Gorka's political allies during that campaign. ''I knew that Sebastian Gorka was a member of Vitezi Rend, even then," said Dr. Gabor Solti, a respected Hungarian geologist who ran for the town council on Sebastian Gorka's ticket in 2006. Solti, who served as mayor between 2009 and 2010, is not known to be a member of the group. Although the three people NBC News interviewed in the town said emphatically that Sebastian Gorka made no effort to hide his membership while he campaigned in the town, they did not provide any evidence of their claims. Picturesque Piliscsaba couldn't contrast more with Sebastian Gorka's current environs of Washington, D.C.
A regular line of cars run along the two-lane road that cuts the town in half, but most are just passing through, stopping for little more than a bathroom break. A large Catholic church next to a cake shop marks the center of the town, which is surrounded by rolling green hills. Erika Laszlo also knew Sebastian Gorka during his failed mayoral bid. Back then, she was the chairwoman of a local environmentalist group called For Piliscsaba, and as part of the group's activities she wrote leaflets about the campaign. "It was common knowledge he was a Vitezi," she said, petting her Labrador during a long afternoon at her woodland home. "And for many people this was a shine on the armor, if you like, because it was the old, golden days before the war." The Gorkas' controversial past does not end with the father and son. In the 1980s, Sebastian Gorka's mother, Susan Gorka, worked as a translator for David Irving, the discredited British historian who caused outrage by suggesting the Holocaust did not happen, or was at least greatly exaggerated. A British judge ruled in 2000 that Irving was a "Holocaust denier … anti-Semitic and racist, and that he associates with right-wing extremists who promote neo-Nazism." And in 2006, he was sentenced to three years in prison in Austria on charges of denying the Holocaust. Irving wrote an email to NBC News describing his warm working relationship with Susan Gorka. "His mother was very helpful, checked translations in the 1980s and tapes of interviews," Irving said. "My impression of both Gorkas [Susan and Paul] was at all times good." NBC News attempted to ask Sebastian Gorka about his mother's involvement with Irving but he declined to answer detailed questions. In addition to wearing the group's medal, Sebastian Gorka has occasionally used the initial "v." in his name — short for Vitezi. He claimed this was merely something to honor his father, but experts interviewed by NBC News were in no doubt that it signified his membership. "I called him Vitez, firstly because he used to call himself Vitez while being in Hungary," according to Gabor Horvath, managing editor of Hungary's Nepszava newspaper. "And second to let the readers know that anyone claiming to belong to the order … it means that he is a right-wing conservative." Gabor Horvath knew all too well that the "v." indicated someone was a Vitezi Rend member — his own grandfather belonged to the order. He too could have inherited the title had it not been for his father marrying a Jewish woman and breaking the family lineage. "In theory I might have been Vitezi myself … not that I wanted to," he said, speaking in his newsroom back in Budapest. "The original charter of the order prescribed a Christian family life." Paul Gorka was born in Budapest in 1930. As a 15-year-old boy in 1944, he "fought with a submachine gun through the ruins of the Hungarian capital," according to Sebastian Gorka's 2016 book "Defeating Jihad: The Winnable War." He didn't specify which side his father fought on — Soviet or Nazi — but a large part of Paul Gorka's life thereafter was dedicated to fighting against the former. After the war, Paul Gorka joined Hungary's underground anti-Soviet resistance. He was caught, jailed and tortured, according to his son's account, but then broke free during the failed revolution of 1956. It was these anti-Soviet acts that earned him the medal in 1979 that his son would wear to Trump's ball. Miklos Horthy, Hungary's wartime leader and the founder of Vitezi Rend, remains a hugely divisive figure even today. Some say he attempted to protect Hungarian Jews from the Nazis, others point to a series of anti-Semitic laws he passed and claim his actions led to the deaths of tens of thousands. Similarly, the actions of Vitezi Rend's original members are the source of some disagreement. The spokesmen for the two modern-day factions said their predecessors were not complicit in the deportation of at least 400,000 Hungarian Jews to Nazi death camps in 1944. "Vitezi Rend had a lot of anti-Semitic, racist members," according to Heisler, the vice-president of the World Jewish Congress. "The organization had some members who were actors in the killing of the Jews," as well as taking Jewish property, he said. Historian Eva S. Balogh fled Hungary to the U.S. in 1956 before gaining her Ph.D. and teaching at Yale. She said that "the likelihood that a good number of the [Vitezi] Order's members embraced the ideas of Hitler is fairly strong." Almost "the entire Hungarian high command belonged to the [Vitezi] Order," according to Balogh, who also runs the news website Hungarian Spectrum and has written extensively about the Gorkas. She said that these Hungarian elites "were avid supporters of Germany and eager to join Germany’s war efforts." Today's Vitezi Rend members, according to Balogh, follow the same "ethical and moral code" as their predecessors in the 1920s — "ardent nationalism, a fostering of Hungarian military traditions [and] an attraction to right-wing ideologies." Aside from the question of whether or not Sebastian Gorka was a member of Vitezi Rend, his credentials as a counterterrorism expert have also been called into question. Before joining Trump's team, he served in the British Army Territorial Reserves, worked as an adviser at Hungary's Ministry of Defense, offered his expertise as a think-tank analyst, and worked as an editor at the right-wing news website Breitbart. The New York Times has been among his outspoken critics in this regard. A headline in a Times opinion piece described Sebastian Gorka as "the Islamophobic huckster in the White House" and criticized his worldview of seeing "Islam as the problem, rather than the uses to which Islam has been put by violent extremists." Gabor Horvath, the Hungarian newspaper editor, agreed. "Obviously he's not the expert he claims to be — obviously," he said. "He got his masters degree and his Ph.D. from the Corvinus University in Hungary. The Corvinus University is not a center for national security studies, certainly not internationally recognized studies of this kind." 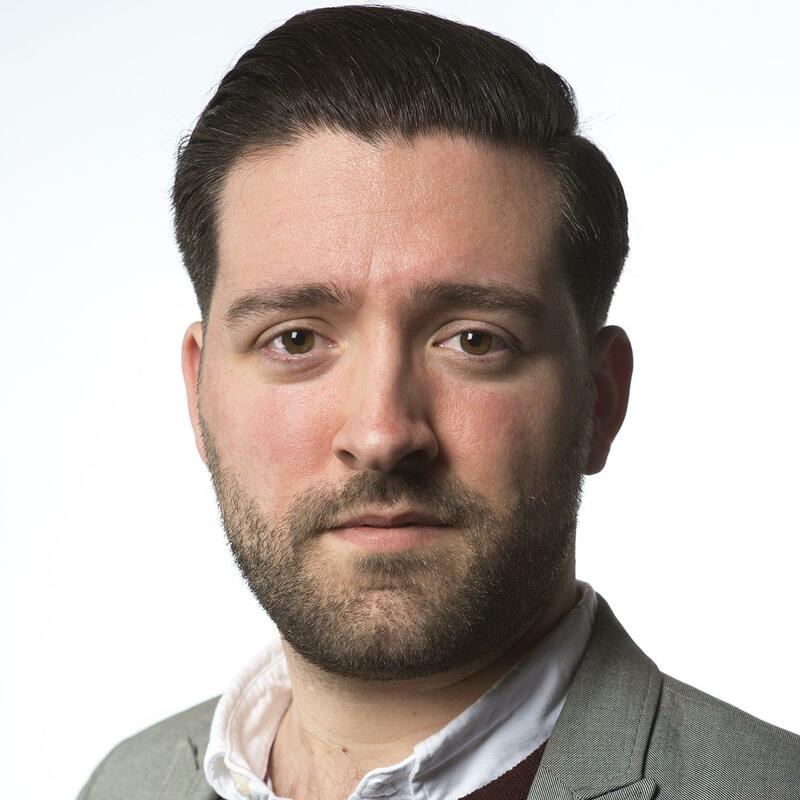 Alexander Smith reported from London and Ken Dilanian reported from Washington, D.C.